Blue Prism World 2019 is our annual technology conference, bringing you the very latest in robotic process automation (RPA), Intelligent Automation and the future of the digital workforce. And this year, the event is going to be bigger and better than ever before. Here’s our lowdown on the expanded two-day event, with the key reasons for you, your team and your customers to attend this cutting-edge automation conference. 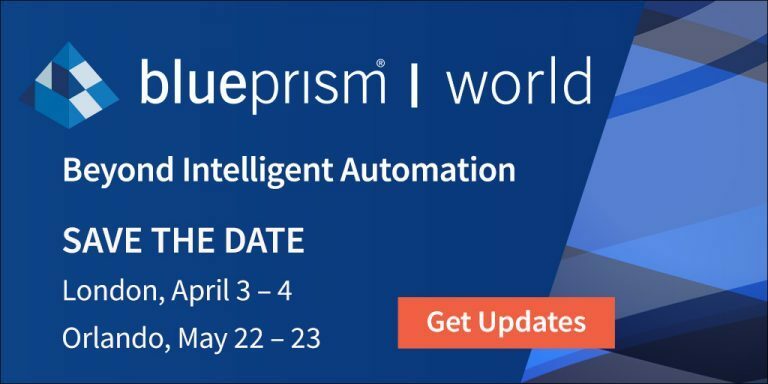 Blue Prism World 2019 will take place on April 3-4, 2019 at ExCel London, UK and May 22-23 2019 at the Orange County Convention Center in Orlando, USA. Following the success of previous conferences, we wanted to expand this year’s event to fit in even more thought leadership and enablement. This means moving to an expanded two-day conference, so we can bring you even more speakers and sessions. Day 1. Thought leadership – focusing on thought leadership and innovation, with keynote presentations from leading automation thinkers. We also made the decision to charge for tickets this year. This allows us to bring you a bigger conference, with the very best in thought leaders and speakers, hosted at premium venues that have the facilities and capacity to host this cutting-edge automation event. We always aim to deliver the best possible support and resources for our Blue Prism customer and partners – and Blue Prism World is central to this added value. We’ll continue to run our free Pulse events and Blue Prism Café webinars throughout the year, giving you the advice you need to get more from RPA. But coming along to our annual conference will help you ramp up your RPA and automation capabilities at pace, while also helping you become a connected and valued part of the wider Blue Prism ecosystem. Learn about the latest platform advancements, product features and industry benchmarks for Intelligent Automation. Hearing from automation specialists and RPA leaders from other businesses, sectors and industries broadens your grasp of automation. By learning from the experts, you build the core understanding and skills you need for your own RPA implementation and evolution. Want to find out how businesses are implementing the digital workforce? Find out from our speakers, partners and customers how they are driving forward with exceptional developments. Listening to RPA implementation stories from organizations who’ve been through the digital transformation process is invaluable. It helps you avoid the common pitfalls, of course, but it also serves to inspire your own RPA journey – giving you and your team the motivation to kickstart new strategies and automation tactics. A chance to cultivate new relationships and build existing ones, all under one roof. If you’re looking to dive into the Blue Prism ecosystem, coming to Blue Prism World is the ideal way to experience the true scope of the network. There will be 3,000 attendees at each event, with a cross-section of customers, partners, sponsors and Blue Prism staff – so it’s the perfect way to start meeting people and building up your connections. Bring your team and help them engage with the mindset, culture and community that drives the Blue Prism ecosystem. Attending the event is an excellent way for you and your team to meet the people and Blue Prism partners who provide their key automation services – helping to share the digital agenda with your people and drive the benefits of automation within your company culture. Wanting to plan or enhance your digital transformation? We give you access to all the information and expertise you need. Our training and experience sessions will give you all the foundational elements you need to start planning your RPA automation or RPA expansion. Having heard from organizations that have experienced real success stories, you can return to the office fired up with the knowledge, advice and tactics for taking you strategy beyond the basics and into a whole new world of connected Intelligent Automation. See You at Blue Prism World 2019! Blue Prism World 2019 will be an experience not to miss, and we very much hope that we’ll see you and your whole team at one of this year’s expanded and enhanced events. We’re very excited to see how much extra value we can squeeze into the longer two-day format, and we’re confident that you’ll go home feeling inspired, engaged and ready to put some genuine drive into your RPA and automation plans in 2019.